Intimate comedy in the back room of a bar. More visceral than a traditional comedy club visit. That’s the kind of experience comedians Richard Sarvate and Abhay Nadkarni are reviving with their brand, The Setup. It’s San Francisco’s most popular stand up comedy showcase, and now it’s coming to Hollywood. The show will be held in the back room of The Three Clubs, which is featured regularly in hit TV show Mad Men. It has a speakeasy vibe and upon stepping into the venue the dim red lights evoke feelings of a 1950’s gangster movie. The vibe is dark and moody. It’s Hollywood’s original martini bar. The bar specializes in classic drinks like old fashioneds and manhattans. At the back of the bar are two vintage plush leather doors. They’re heavy and need a generous push to open. Behind them is a secretive back room that seats about 60. The arrangement is tight. The audience sits with their feet touching the stage. The light from the neon sign casts a comforting glow across the room. A revolving door of touring stand-up comics, late-night writers, movie stars and more grace the stage at this special night of entertainment. They come from diverse backgrounds and their styles are equally variable, from theatrical monologues to raunchy anecdotes. Richard hosts the show and begins by talking to the audience in order to break the ice. A few people in the front row get a “deer in the headlights” look. “What do you do?” Richard asks a shy mid twenties male to the left of the stage. A few whistles come from the back of the room. “You’re whistling for an accountant?” The audience erupts with laughter. The show is on. “This is a very supportive audience,” says Richard. Richard is a Bay Area native who spent 10 years working as a programmer. He’s quit the tech industry for good and is now a stand up comedian. His mother is a schizophrenic. All of this is fodder for jokes. He’s a favorite at the SF Punch Line, he tours internationally, and has worked with superstars like Roseanne Barr. “Comedy audiences want a memorable experience. 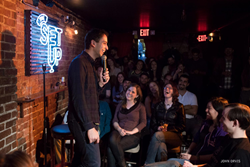 They don’t want to just ‘go’ to a comedy show,” says Nadkarni. “That’s what we strive to deliver at The Setup. We work with venues that have history and culture so it leaves a lasting impact.” Abhay is a USC Trojan alumni that started stand up in the gritty neighborhood of downtown LA. As an outsider, his act centers around him trying to fit into the American way of life. He's an impressionist, comedian, and creator of the Desi Comedy Fest, the largest South Asian comedy festival in the United States. He’s appeared on CBS and has been part of the World Series of Comedy, Ventura Comedy Festival, and SF Sketchfest. After the show the performers hang around for a drink and mingle with the audience. It’s casual and friendly. It’s a great opportunity to have a real conversation with some of the most talented comedians in the industry. Aiko Tanaka (Fast and The Furious). It’s every 4th Thursday. Tickets are $10 and can be purchased at http://thesetupla.eventbrite.com.